Theory based products are heavily inspired by Magpul Dynamics curriculum and weapon manipulation techniques. They are specifically designed to change the manual of firearms or modify a shooter's technique to increase speed and efficiency. Simple plug and play functions does not apply, these are considered "theory based products". 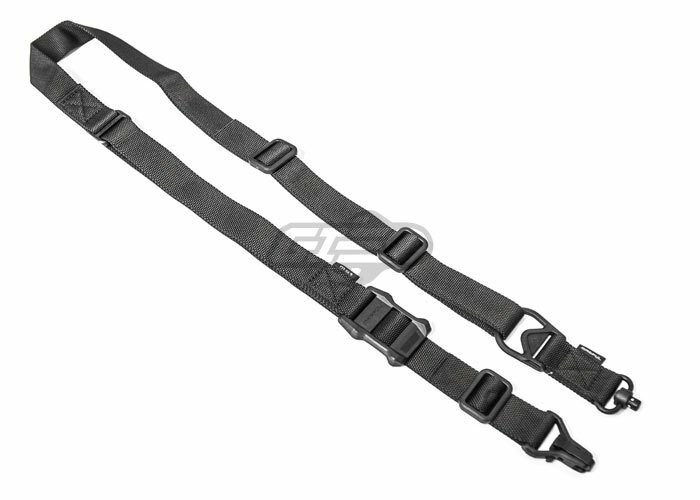 The Magpul MS3 sling is designed for use with the ASAP, MSA, RSA, and other clip-in sling attachment points. The Magpul MS3 Sling is designed for convertibility from one-point to two-point mode to dynamically adapt to the mission at hand. The Magpul MS3 Sling allows for a fast transition with quick-release Paraclip. The one-handed adjustment loop for sling tension allows the user to quickly adjust without having to release their rifle from the sling. The lightweight webbing is constructed out of a heavy duty hardware/ material to handle stress under the most harsh conditions. The 2 point configuration allows for greater retention and supports / distributes weight better. The 1 point configuration prevents the user from dropping their gun to the ground when they need to employ both hands or transition to a sidearm. However, you would not necessarily want to climb, run, or even walk an extended distance in the 1 point configuration and that is where the advantages of the 2 point come into play. The different configurations and quick adjust ability of this sling make it adaptable to most scenarios. How would i go about attaching this to my fn herstal scar h? My gun comes with 2 sling points but i can't seem to fit anything on them. Would i have to buy the rail sling mounts to fit this sling on my gun? Yes, i would say getting the ones that mount to the rails would be the easiest.